An electric toothbrush needs a power source to be able to work. That power source is a battery or batteries in some cases. Electric toothbrushes come in two forms: those with removable batteries (designed to be removed) and those with fixed internal batteries (not designed to be removed under normal circumstances). 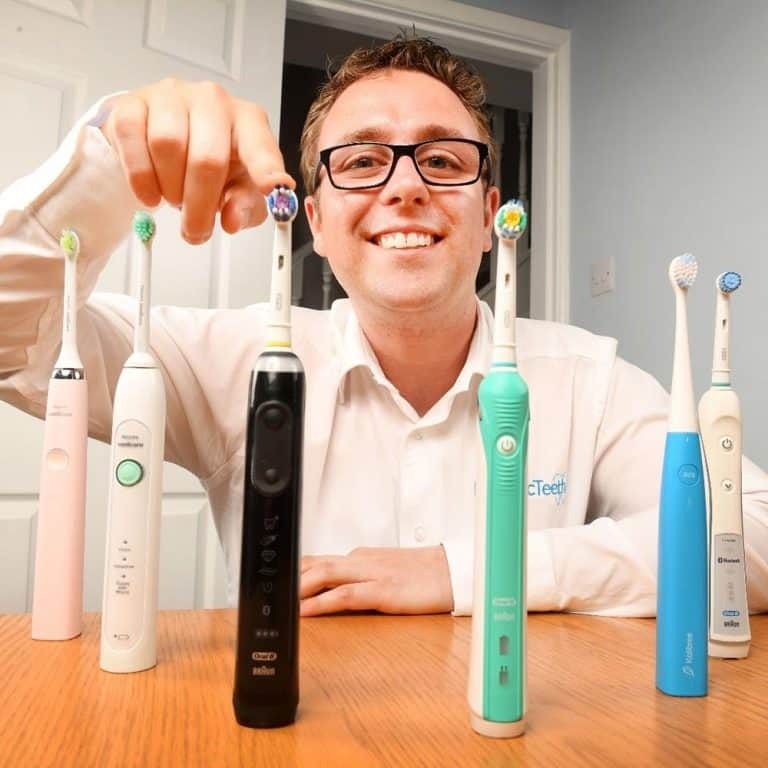 In this article I will explain how to charge an electric toothbrush, how it works and how to know when your brush is charged. Does your brush have removable batteries or not? The first thing to determine is if your brush has a fixed internal or removable battery. Most electric toothbrushes have batteries fixed inside, which can be removed with tools, but are not designed to be done at home. Cheaper or more basic brushes have removable batteries. Quite often these are removed or replaced via the bottom of the brush handle. It will normally be quite obvious or not whether you can remove the battery. There will be a removable cap that gives access to the battery compartment. Most brushes that do not have removable batteries will have a recess on the bottom of it that looks similar to that in the image below. If there is no obvious way to access the battery then it is likely the brush has a built in battery. If the brush came with batteries that is a sign that it has removable batteries. If the brush came with a charging stand then this is a sign that the brush has a fixed internal battery. I will now guide you through the charging process and how to know if your brush is charged. I have split this article into two parts. The first part is for those what have brushes with built in batteries, whilst the second part is for those who have brushes with removable batteries. How do I charge a toothbrush with non removable batteries? This article is designed to explain the charging process for the majority of electric toothbrushes. There are always one of two that fall outside of what is the normal process. This is a guide only and it is always advised where possible to consult your instruction manual or the direction provided by the manufacturer of the brush. In most cases, an electric toothbrush is charged by sitting the brush handle onto a charging stand. The charging stand will normally come provided with the brush. It will be a round or square shaped plate in most cases with a prong (protuberance) that sits upright in the centre. On the base of the electric toothbrush will be a recess into which that prong fits when the brush is sat on the stand. Typically the brush will stand in an upright position when on the stand to receive charge. Most charging stands have a cable wired into them that leads to a plug that connects to the power outlet in the bathroom. It is normally a 2 pin plug. This is not a European mains adapter. This 2 pin plug can be converted to a 3 pin plug thanks to adapters, if you do not have a 2 pin socket in your bathroom. A bit confusing I know, but the article 2 Pin Plugs & Adapters for Toothbrushes Explained should clear up any confusion. Many question how this charging works, without physically connecting a cable to the brush. It uses a technology called inductive charging. We explain how a toothbrush works in another article, but the short explanation is that the charger uses a coiled wire inside the charging stand and a coiled wire inside the brush handle. An electromagnetic field an electrical current is passed between the coils, in turn passing the charge from the stand to the battery inside the brush handle. 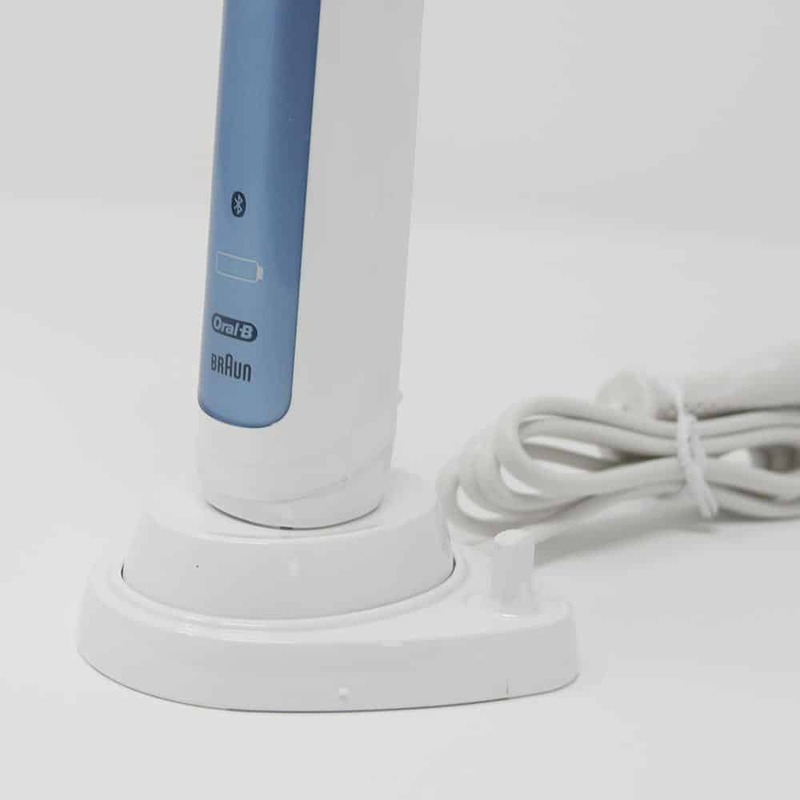 So when the charging stand is connected to mains power a current is transferred from the socket, through the stand into the toothbrush and over time this recharges the battery inside the brush. As mentioned there are a few exceptions, such as the Philips Sonicare DiamondClean. It appears to charge in a glass. It works using the same technology, just implemented slightly differently. The Sonicare DiamondClean and the Oral-B Genius 9000 both can be charged in a travel case rather than a stand. The principle of how they charge is the same, it is just implemented slightly differently. If you are wishing to find out how to charge your electric toothbrush when travelling abroad to different countries with different sockets and different voltages, read our guide ‘Using An Electric Toothbrush Abroad‘. How do I know when the batteries are charged? How you know whether your electric toothbrushes battery is fully charged or not will depend on the brand and model that you have. Whilst between all of these there will be subtle differences in how you can tell whether they are charged or not, there are some general rules you can consider to help decide. For the most accurate information for your toothbrush refer to the manufacturer’s documentation. Whether you have an Oral-B, Sonicare or Colgate toothbrush, one way to ensure your brush is fully charged is to leave it on charge for a long period of time. The vast majority will charge fully within 8-16 hours, but some can take up to 24 hours. Irrespective of brand if you left it on charge for 24 hours, it would be fully charged by the end of it. Some brushes will have a battery status icon on the front of the brush handle. Normally if this is a solid green colour or no longer lit then the battery is fully charged. If it is a flashing green, it is quite often charging. Red or yellow colours usually depict less charge or almost no charge remaining. Some brushes will have a battery icon on the front of the brush handle that may well be split into 3 or 4 bars. If all 4 bars are lit, this is often a sign it is fully charged. In most instances, manufacturers do suggest it is safe to leave your brush on the charging stand at all times. If you take this approach it is unlikely you will ever be in a position where you are out of power. Sonicare suggest as a general rule that the charging times for all their models are up to 24 hours. Longer than Oral-B, this is typically because their batteries last longer, but they do also suggest it is fine to leave it on the charger. Some models will give indicators via the charging lights and battery status icons as explained earlier. A good tip to ensure long term reliability and performance from your brush is to discharge the brush completely every 6 months and then recharge it fully. Such activity helps ensure a long battery life. It is also worth noting that if you need to use the brush and it has not finished charging this is fine. Use the brush and replace it on the charging stand. Brushes that have run out of power completely may need 30 minutes or so on the charger before they can be used for one clean or before any charging lights may appear. How to I charge a brush with removable batteries? When a brush has removable batteries, you are not charging the brush. This is a term that applies only to those with batteries built into the brush handle. There is to no way to recharge the batteries whilst inside the brush. In this instance you need to dispose of the batteries that came out of the brush and replace them with equivalent new batteries, typically they are AA or AAA batteries. You can buy rechargeable AA or AAA batteries. These rechargeable batteries can normally be used in a brush that accepts removable batteries. These rechargeable batteries need to be charged in a special plug/piece of equipment that you would have received (in most cases) with the rechargeable batteries. If using removable rechargeable batteries, do not throw them away, simply put them in the charger when the power has run out and leave to charge until they are full (follow instructions from manufacturer of batteries). Once charged, place back into the toothbrush. Quite often the charging module for the batteries will give an indication when they are charged or not via an LED or status symbol on the charging unit. There are a vast number of different types of rechargeable battery units, so this may not apply in your particular instance, so where possible refer to the manufacturer’s instruction manual. More often than not a few hours on charge will replenish the battery. If you have any further questions or queries and need help, please do let us know, by leaving a comment below or contacting us. It’s unlikely that a battery toothbrush will fit on the same charging stand, but if it does then no charge will be passed as it doesn’t have the technology built in to do this. i have got an OralB toothbrush and very happy with it. I want to buy an extra charger for an extra brush. Now that i have seen the Sonicare glass, i thought of that as an option. Can you tell me if an OralB brush will charge as well in a Sonicare glass? I have not done extensive testing, but if I recall 18-24 months ago I did a quick test to see what happened. I believe the Oral-B model did charge in the Sonicare glass, but it was very fussy, it was slower and really was not an advised route to go. You see, the DiamondClean range that comes supplied with the charging glass have flat bases to the brush handle. These flat bases provide the surface area for the charge to pass through and into the handle. With Oral-B brush handles and many other Sonicare handles, the base is flat but also has a recess into which the charging stand fits. Because the setup is different the efficiency with which the charge is transferred is considerably less and much more unreliable due to the configuration. thats a shame. then i just have to go for a normal charger. Is it ok to charge my Philips Sonicare on a Samsung wireless charger base? I can see the brush charge light comes on and it beeps once as it does on the correct base so I am sure it is charging but am worried about the charge rate received by the toothbrush. Technically, the Sonicare accepts Qi charging, which is what the Samsung charging pad is offering. I have tested this myself previously and found mixed results. Whilst it appears to work I found that little charge got through or it was unreliable in comparison to the standard charging stand. That said, the charging pads are always improving, so different pads may mean different results. Try it and see what happens, you should soon discover how well it works or not. My husband asks me to remove his oral b electric toothbrush from the charging stand when I turn the electricity supply off. He says leaving the toothbrush on the charging stand, even when there is no power supply to the charging stand, will drain the battery. I can’t see how this can happen. Please can you help us to resolve this dispute?! I am not trained in electronics or physics to be able to properly answer your question, but as I understand it, any device with a built in battery and electrical circuit will run down over time. This time period is a very long time though. For example you might put an old mobile phone in a drawer. It had power in the battery when you placed it there but 2 years later it is dead and requires recharging. I believe this is because there is still a very small charge going round the circuits inside. I am not sure if my answer is technically right or not. It sides a little with your husband, but I would suggest your husband is a bit overly concerned if he genuinely is worried about this issue. My daughter has manged to break the prong on the charging stand of her Nevadent NSLP 3.7 A1 electric toothbrush. We bought it from Lidl a few months ago. My question is can the toothbrush still be charged if she just sits the toothbrush on the stand without the prong or do we need to replace the stand? It is possible, subject to the damage, the brush may still charge. If the plastic housing has cracked but still sort of in tact, then it may work. If the prong on the charging stand is completely broken and internals of the charger exposed then there is a strong likelihood that he damage may well be too great and it will not charge. What is the best battery operated (non-rechargeable) toothbrush. I don’t want to be bothered with plugging something in to recharge. There is not room in our bathroom for that. In our opinion, the best electric toothbrush with a removable (non-rechargeable) battery it is the Fairywill 959 as per our Best Battery Toothbrush article. I hope this helps. I have just bought an Oral B Pro 3 3000. On first use, I charged the brush fully and am using it. My question is, to get the best battery life, should I let it completely run out of batter power before I charge it again or should I top it up after a few days? I asked Oral B this question and got advice that contradicts what is on their website. There can be conflicting information because some brushes use different battery technology. It is always best to refer to the user manual to ensure you are following manufacturer guidelines, but generally there is little about getting the ‘maximum life’ out of the brush. In most cases it is fine to leave the brush on the charging stand, constantly being topped up, because the circuits inside stop overcharging. I believe (I am no engineer to understand battery technology) that it can be beneficial to discharge the battery almost, if not entirely every 6 months or so and then recharge it. I typically fully charge my battery and then charge it again when low, this way the brush goes through a proper ‘cycle’ rather then the constant top up of power and never going below 80% power, if you see what I mean. Some may disagree with this approach. In all reality, the battery life tends to be pretty good and I have yet to see evidence that a proper routine to maximise life of the battery really pays off. I first bought one of the vialtey brushes and it worked for the first time after it loss charged it didn’t work and then worked for once brush and stopped working again. The green light may not flash straight away if the battery is completely flat. Usually after about 30 minutes on charge it should begin flashing. Leave it on charge overnight and it should be close, if not fully charged. Absolutely fine to leave it on the charging stand Helen. I have left my Oral B tooth brush charging on its stand in the bathroom at my holiday home. I will not be there for another 5 days. Will it be safe? Will it automatically cut out when charged? Thanks. Yes, it will be perfectly safe. I have the same question I left for a vacation and I will be away for 10 days and forgot to unplug my Sonicare , is that totally safe or there is a risk of fire ? Is the toothbrush on the charging stand, or is it just the charger that has been left plugged in? We couldn’t say for certain that it will definitely be safe. Personally if I leave mine plugged into the shaver socket over night, the socket gets very hot. I wouldn’t want to leave it on there for 10 days straight. Most brushes have electronic circuits that cut off the charge to the brush when they are fully charged. This means, the brush, if left on the charging stand, should not continually draw power. If there is no brush on it, although the charging stand will be receiving power, it should be fine. I purchased Oral-B PRO 3 3000, which has LI-ION battery that should last ~2 weeks. In this case, do you recommend leaving the brush on the charging stand at all times, or should I charge it every several days? I’m interested in increasing the battery lifespan as much as possible, it’s not important to me that it will be fully charged at all times, just not to be completely out of juice. Specifically for lithium batteries, I know their lifespan is measured by charging cycles, meaning full charge and discharge, and it’s best to leave it charged around 60%, and not let it get to 0% or 100%. Anyway, with all this information, how do you recommend to charge it in order to increase the battery lifespan as much as possible? In order to get the absolute best life out of the brush over the years, it is probably better not to have it sat on the charging stand at all times. The brushes & charging stands do have technology built in that means the brush will stop charging when the battery is full, so not too much harm can come to it. What you will probably find is you are likely to get the best life out of the battery, if you fully charge it, use it for 10 or so days and then top it back up, that way the battery is not constantly being ‘topped up’ but actually recharged, with almost full cycles being run on the battery. I am no battery technology expert, so there may well be different opinions, but by letting it discharge a fair amount will certainly help I do believe. Can I charge an oral b toothbrush on a sonicate charger? Is the induced voltage the same? I have an Oral B Pro Trizone 6000 and it is only holding charge for 3 or 4 days. Can I replace the battery. Yes you probably can. The video here might help. Please be aware Oral-B nor us here at Electric Teeth advise it or can provide advice as to the steps you should take. I have misplaced my charging stand for my oral b Braun toothbrush. Can I buy one? Where?? Take a look at this article – If you are in the UK, the link to the charging stand you will likely need is the first product in the list. Any issues let me know. Hi Michael. There are a couple of models that do not have a charging icon, I suspect it might be a Vitlality model. Does it look like the brush shown in the photos in this review? I both two of toothbrushes oral b pro 2500 and I use all the instructions and they not charging, what can be wrong? Have these brushes been charged successfully before? Are you connecting them to a socket in your bathroom? Perhaps you could provide a little more information for me to be able to assist you. How does an electric toothbrush work? Can electric toothbrushes get wet?